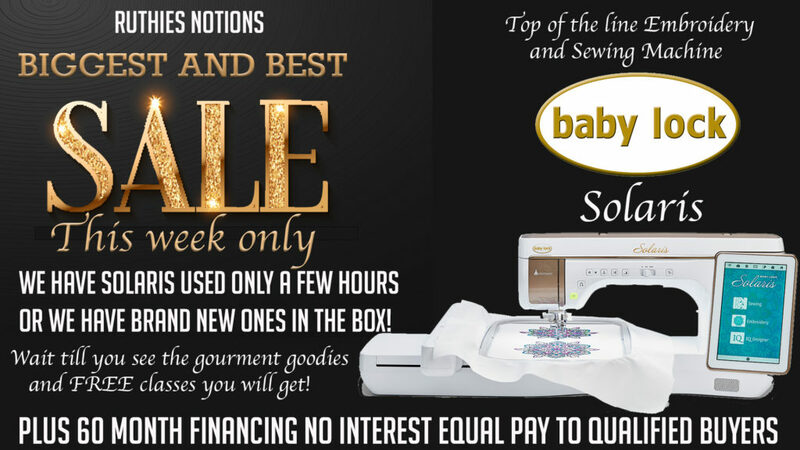 View our list of Sales and Specials on Baby Lock machines! THIS WEEK ONLY!!! 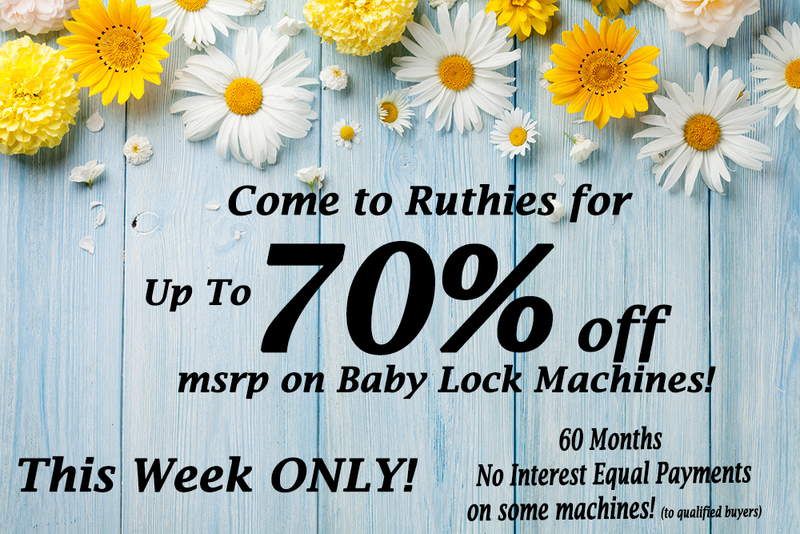 70% off msrp on Baby Lock Machines! 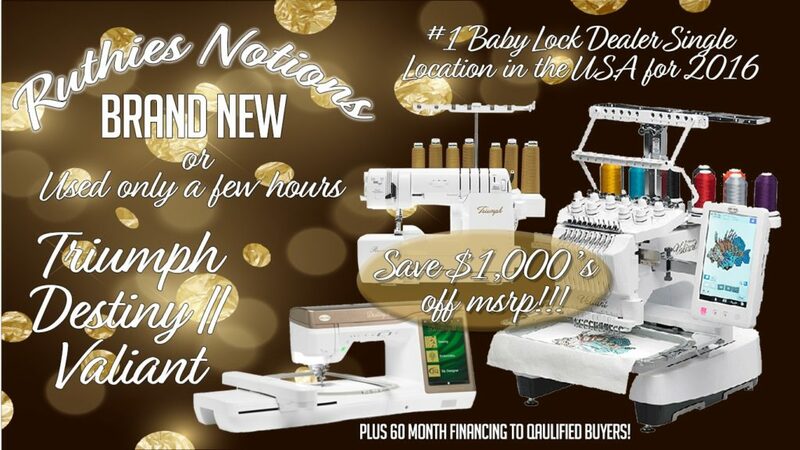 Baby Lock Machine Specials All Month Long!!! 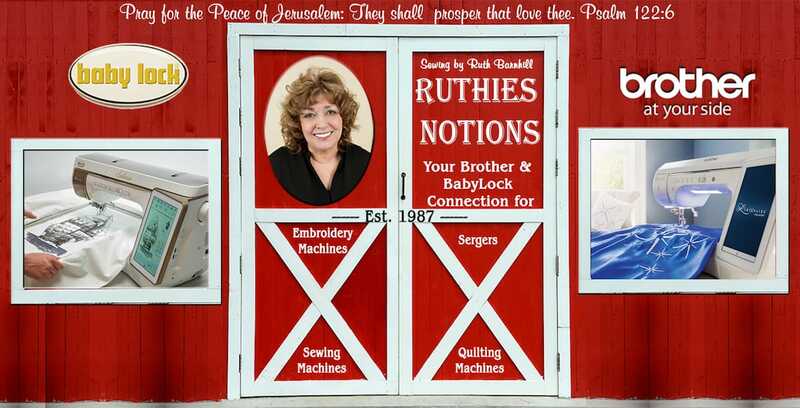 Come to Ruthie’s Notions today to see all the great deals on Baby Lock Machines!! 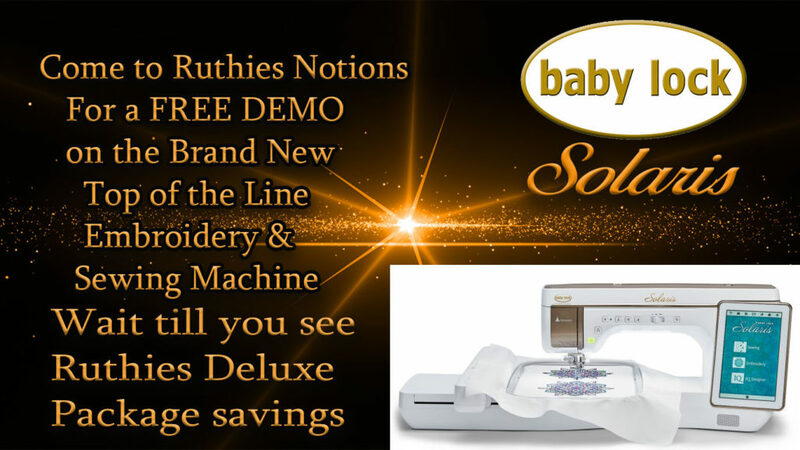 Ruthies Biggest and Best sale EVER on the Brand New Babylock Solaris top of the line embroidery and sewing machine today! We have the best sale going on now we have a Solaris used only a few hours or brand new in the box. Plus 60 month financing no interest equal pay to qualified buyers. Plus lots of gourmet goodies included and FREE classes too! 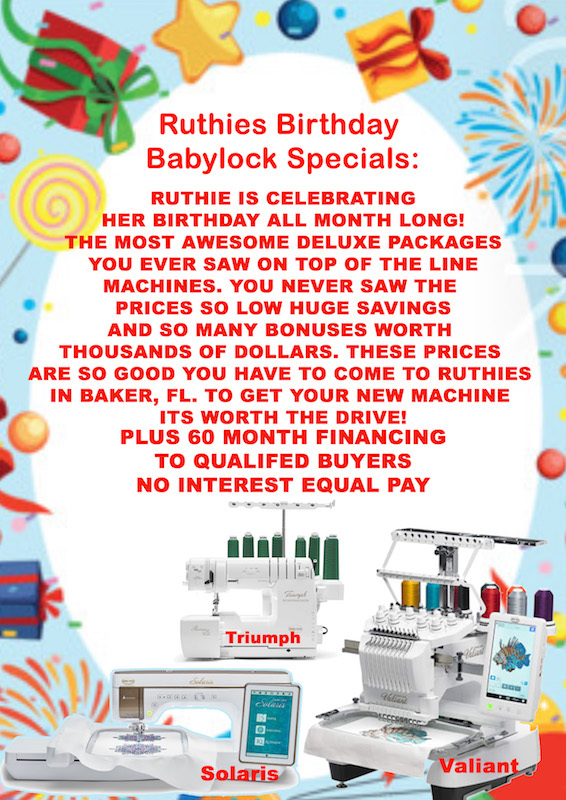 Ruthie has the Brand New Triumph on Sale Now! It even threads the needles that’s HUGE! You can even do 87 different combinations. Plus I can make a shirt in 10 minutes. Plus we have a couple used only a few hours or Brand New one in the Box! You can create the most adorable children clothes you ever saw or beautiful things for your home. It is endless of possibilities! 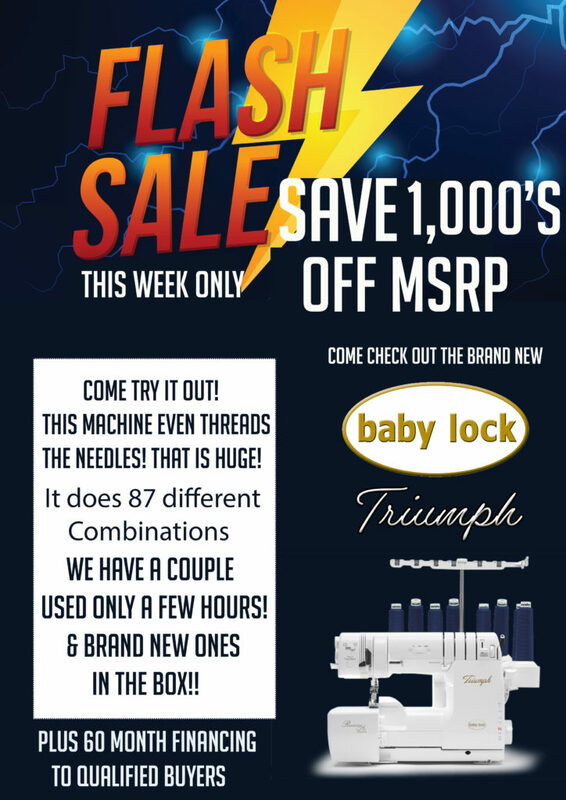 SPECIAL ON BABY LOCK TRIUMPH, DESTINY II, and VALIANT MACHINES!! We have either brand new or machines that have been used for only a few hours. Save $1,000’s off MSRP!! Plus we are offering 60 Month financing to qualified buyers. 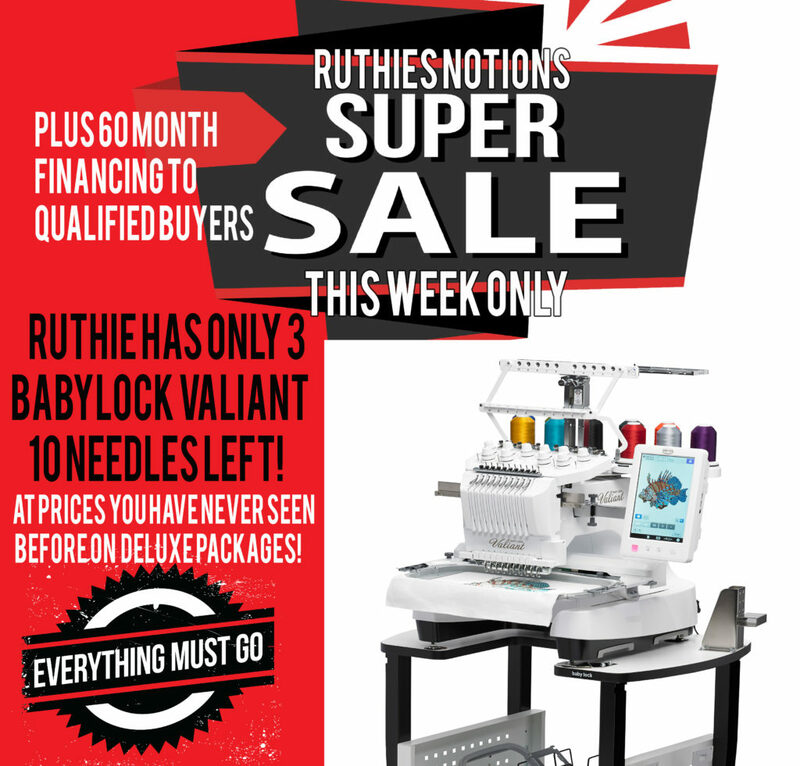 Ruthie just got a Big Shipment in of brand new Destiny II’s, Valiant’s, and the brand new Triumph Serger from Baby Lock!!! Once a year at Baby Lock Tech, we get the opportunity to receive excellent pricing on machines. So now we are passing it on to you!!! Plus we are offering 60 month, no interest equal pay, to qualified buyers! Buy a Triumph Deluxe Package and save over $1,700.00!! Buy a 10-Needle Valiant Deluxe Package and save over $7,000!! Buy a Destiny II Deluxe Package and save over $2,700.00!!! Hurry in! We only have a few machines at these HUGE SAVINGS!! Don’t forget, we are offering 60 month financing, no interest equal pay, to qualified buyers!! 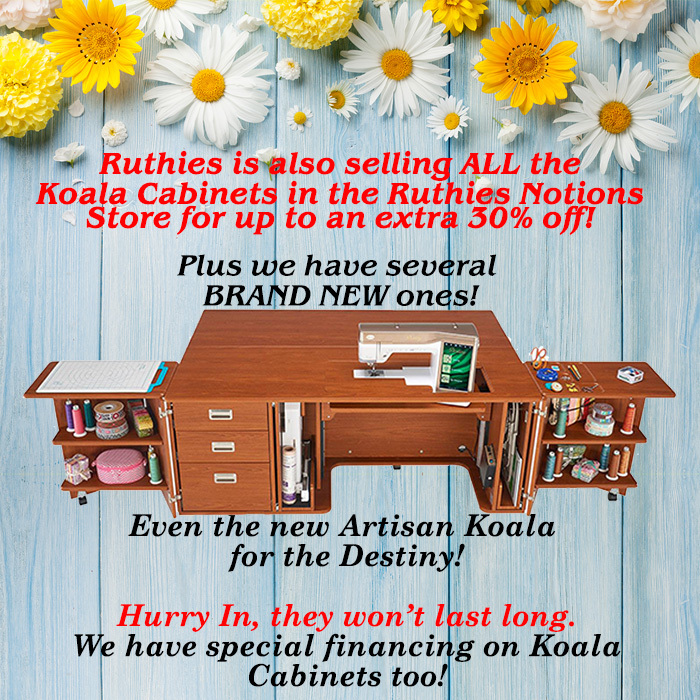 Ruthie is selling ALL Koala Cabinets for up to an extra 30% off!!! Hurry in! They won’t last long! 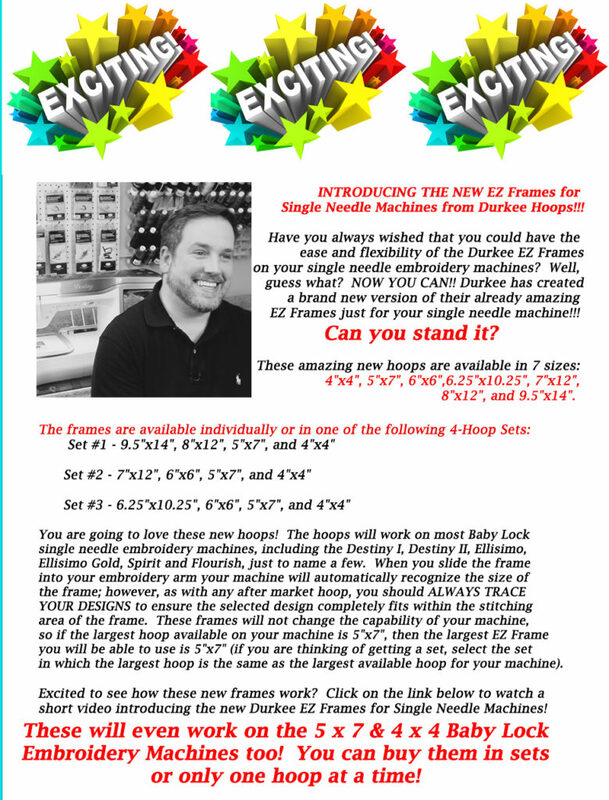 Introducing the NEW EZ frames for single needles machines from Durkee Hoops! These hoops will work on most Baby Lock Embroidery Machines!! You can buy them in sets or one hoop at a time! 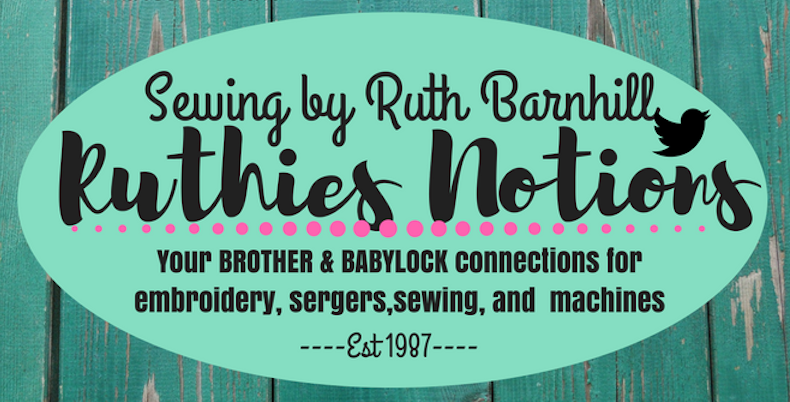 Click here to view our Brother machine specials! !